In the last episode, Theo tries to call in that favor of Gordon to try and take down Penguin as he continues to try and fight back against Theo. Gordon figures out that Theo isn’t as innocent as the world of Gotham believes him to be and is now making it his mission to prove that to Barnes. In this week’s episode, ‘Tonight’s the Night’, Theo gives Barbara the green light to kill Gordon but will he be able to fight back? Thompkins worried that Gordon is getting himself in to deep especially now that Barbara is showing her hand. With Theo feeling Gordon’s presence, he makes a move on Bruce and trying to gain control of his company. Which means that Barbara going to get her chance to kill Gordon. That is unless Thompkins has something to do with it. Could she get caught in the crosshairs? Only time can tell. Theo talks to Bruce about Wayne Enterprises and about the corruption in the company. It makes one wonder if maybe Theo is creating these false companies with Wayne’s name on it so that he can get total control of it. Which involves buying it from Bruce. He bribes them by saying that he knows who killed his parents. Could he have been the one that killed his parents? That would be an interesting twist considering how much he hates on the Wayne’s family. When Alfred finds out, he starts to wonder about Theo and Bruce’s relationship. He doesn’t want Bruce to sell the company and knows that Theo is trying to extort him. He tries to talk him out of it, but with the 13 year old brain, will he make the right decision? Gordon falls for Barbara’s ploy and follows her on the hopes that she can tell him about Theo. There are times when he shows his brilliance at being a detective, but with Barbara, he never seems to make the right decisions. This once again proves it as he and Bullock get ambushed. Barbara uses Gordon to try and make her dreams (literally) come true. She takes him to a church where she wears her wedding dress that she bought for their wedding. Barbara brings Thompkins into the mix wanting Gordon to talk about the darkness in him. When she finds out Gordon does in fact tell Thompkins, she is caught off guard. There is a final battle between Gordon and Barbara that results in Barbara getting into critical condition. While Gordon may not love her, he still cares about her and didn’t want her to die. Let’s see if and how much it will effect his relationship with Thompkins. Bruce doesn’t end up selling his company but Gordon is able to get what he needs to arrest Theo. With the help of Barbara, he finds Mayor James. Meanwhile, Nygma, who is officially now The Riddler, brings Kristen’s body to the forest so he can get rid of her remains. He thanks her for bringing the crazy side of him to the surface which is a little cliché as the person who breaks him is the one that is ‘closest to home’. Things get out of hand as he there are a lot of ‘foot’ traffic in the secluded forest. Turns out that foot is Penguin. 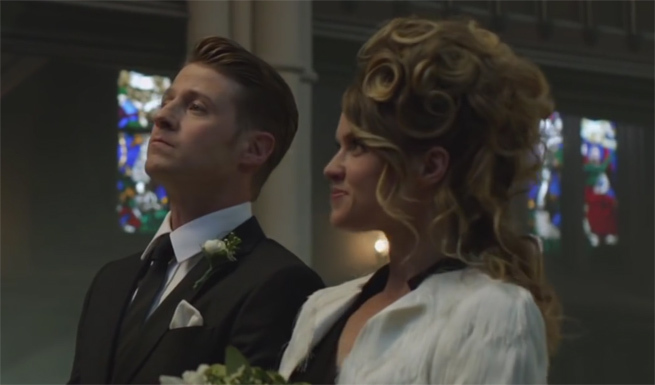 In the next episode, Nygma offers to help Penguin while Gordon tries to break Theo. This entry was posted in TV and tagged Batman, FOX, Gotham.